It would be easy to attribute 2Fort’s popularity to its simplicity, but I doubt this has ever been true. I’d rather suspect that 2Fort triggers the deathmatch sensibilities of players, not at last because its bad design has written DEATHMATCH CENTRAL all over it. Since all routes lead through the middle area, this is where much of the action takes place. People are usually awfully busy killing each other around the bridge. Oh yes, they try to fake playing CTF. They actually guard the ramp rooms. Well, engies have to place their sentries somewhere. 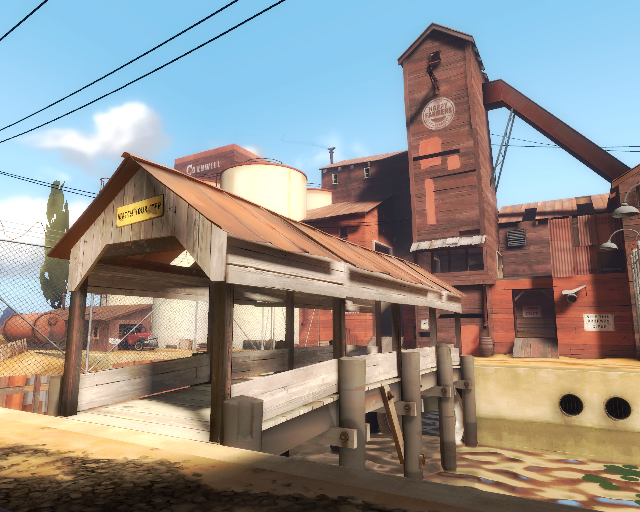 Although engies also love to defend their team’s briefcase (I refuse to use the term „intelligence“ in any way related to this map) in or around the enemy base. 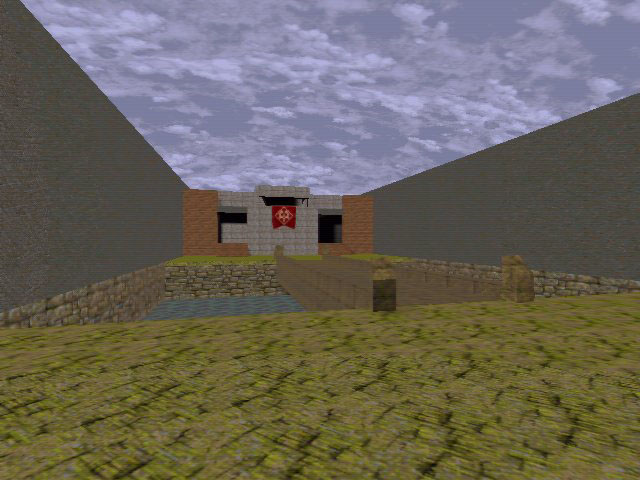 It is less common to have some defense near the upper respawn, guarding the entrances via the battlements and the grate above the main entrance. It is more likely to leave that respawn finding an ENEMY player defending THEIR CASE there. 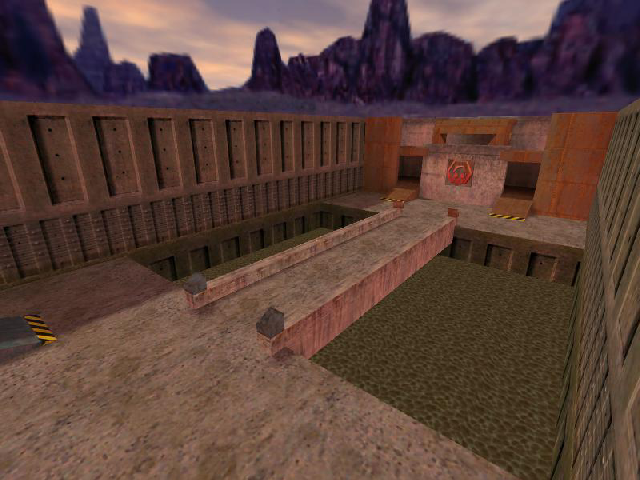 And just when you thought things could not get any worse, Valve comes in and puts a bloody roof on the bridge! Yes, I understand why: Since scouts can no longer use concussion grenades to get to the enemy sniper deck the roof became necessary as an alternative route for the scouts. So now snipers even have an excuse to no longer do their job and prevent heavy classes from crossing the bridge, and can instead concentrate solely on their most favourite game: The „Which sniper can kill the opposing sniper first“-contest. Okay, not a big loss. Snipers playing 2Fort are not interested in their team’s briefcase anyhow. They are too busy wanking. And Valve is lending a hand. So basically everything which is bad or lame in TF2 – Sniper Wars, Deathmatching, Respawn Camping, Turtling, you name it – chances are all too well that you can find that in a match on 2Fort. And yes, it was worse in TF and TFC where each class was carrying hand-grens (not to mention mirvs). Thank a higher entity of your choice for small favours. Which can sometimes lead to a few smart and skilled attackers making a fool out of all this heavy defense. But sadly many times those turtled defenses end up in stalemates. And stupid Sudden Death actually rewards one team for its lame turtling. Sums up very nicely why I’ll gladly sit in spec whenever this abomination of a map comes on the server, nice write up mate.